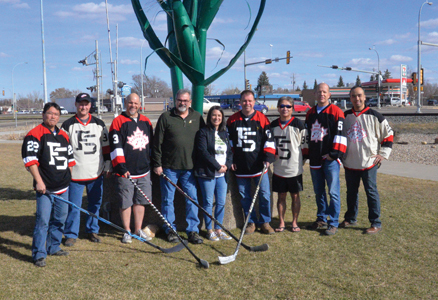 The Taber Fading Sons have continued their tradition of donating tournament funds to local organizations. With over $15,000 raised this hockey season, the money was split between the Logan Boulet Fund of KidSport Lethbridge & Taber and the Taber and District Hospital Foundation with each getting $7,750. With KidSport’s mission to remove financial barriers for kids wanting to play organized sports, the choice was easy to put the money forward for the organization. Logan’s parents Toby and Bernadine Boulet were on hand to accept the check on behalf of the Logan Boulet Fund of KidSport Lethbridge & Taber and they were happy to see support from the Taber area. “It is very important to us because Logan played seven sports and he was a multi sport athlete. Our kids didn’t go without, we’re both school teachers and we made enough money to take care of things but time was always an issue. So when it came time to make a decision as to where people can send money or in lieu of flowers, we picked the KidSport Fund out of Lethbridge and Taber so it is all of southern Alberta. It goes into the Logan Boulet Fund of the KidSport fund. They operate it, we don’t operate it and they release $10,000 a year to anybody to a maximum of $300. It doesn’t matter what sport you play or when, but the money goes to you,” said Toby Boulet. With the Taber community providing a large push of the funds, Boulet was happy to see the support come from all over southern Alberta. Likewise, the Taber Fading Sons expressed gratitude for the continued years of support and donations. With previous donations to the Kidney Foundation, Lung Association of Canada and many others, they say it wouldn’t have been possible without the community’s support. “You see it time and time again with this community, with the Taber Charity Auction and numerous other fundraisers. We aren’t a fundraising group, we’re just a hockey group but it started with humble beginnings. During the tournament, a couple guys said they would shave their hair for cancer and it started out as just a few hundred dollars. It just took on a life of its own and it is awesome to see the group be so charitable and community minded. Everyone works hard and pitches in to make sure we are raising that kind of money year after year. We keep saying ‘we won’t top this’ but we keep doing it,” said Pickerell. As the group donates a staggering $15,000 back into the community this year, the Fading Sons are happy to keep the progress moving forward for years to come.